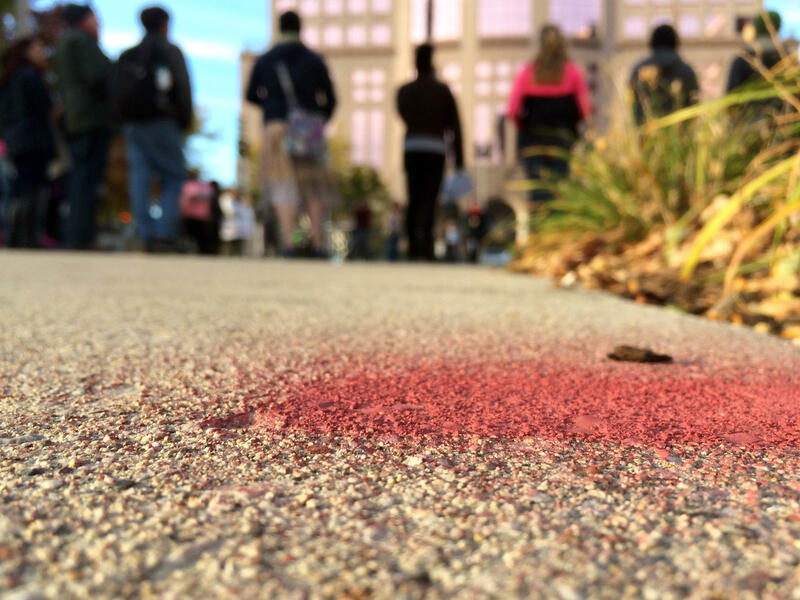 The family of Dontre Hamilton marked a spot in red paint to memorialize where he was shot by a Milwaukee police officer. That finding was part of a study that the authors say is the first of its kind: an examination of how much structural racism shapes fatal police shootings. But in order to examine structural racism, the researchers first needed a way to capture it. So they created a metric called the "state racism index." It took state-level data on black-white residential segregation, as well as disparities in educational attainment, employment status, economic status, and incarceration status, and scored each of these variables. Those scores were then tabulated into a number on on a zero to 100 scale; the higher the number, the more pronounced the structural racism in a state. According to Michael Siegel, one of the study's authors, one variable in their racism index mattered more than the rest. "The more racially segregated the neighborhoods in a state, the more striking the ratio of black to white police shootings of unarmed victims," Siegel said. "It came as a surprise to me personally," Siegel said. "Traditionally, we're taught that racism is [most visible] in the South, but we're seeing here that it's the Midwest and the Northeast." Siegel said the findings underlined the different regional mechanics of American racism. In the South, the oppressive systems of slavery violently entrenched racial caste in a way that, paradoxically, brought black and white Southerners into fraught social and geographic proximity. But black Southerners who moved to the North in the early 20th century for jobs in big industrial centers like Milwaukee, Chicago, and Newark, settled into racially and economically isolated neighborhoods and ghettos. That separation was maintained through insidious housing policies like redlining. While the legal underpinnings of segregation in the South were formally, if not practically, overturned by the courts, the ways cities in the North and Midwest maintain segregation are enduring and hard to see. That means major metro areas outside of the South are among the nation's most diverse and most deeply partitioned. So why does black-white residential segregation influence fatal police shootings of unarmed black people? One theory is that segregated black neighborhoods tend to be more heavily policed than others. That's definitely true in Wisconsin: the state incarcerates a higher percentage of its black male population than any other in the country — and it's not even particularly close. A study from 2013 found that in Milwaukee, the state's largest city, half of all black men between the ages 30 and 40 have been behind bars at some point in their lives. And the city's 53206 ZIP code is 95 percent black and has the highest incarceration rate of any in the country. But Siegel says that doesn't explain the whole story, and instead suggests that residential segregation manipulates implicit bias — the way people of all races subconsciously internalize ideas about the dangers of certain racial groups. "We know that officers...have to make split-second decisions in situations of high perceived threat, and you can see how officers who work in a so-called 'black' neighborhood can perceive a much higher level of threat than officers who are working a similar beat in a white or mixed community," Siegel said. "It doesn't seem to be the case that all police officers out there have an equal level of implicit bias — of course they all do to some degree — but we're finding that implicit bias is much more marked in states that have higher degrees of structural racism." In other words: the more segregated a place, the more intense the personal bias of its police officers; the more pronounced that bias, the more it creeps into their interactions with black residents, with sometimes deadly results. Siegel said he hopes the research helps move debates about police violence away from the language of rogue cops and "bad apples" and toward addressing the conditions that make those shootings more likely.